I love sunsets and chasing the sun. As a youth on hot, summer nights in August I remember trying to get those last few minutes out of the daylight as the sun was setting. I was desperately trying to cling to my last few moments of summer while chasing the sun. Watching the colors mix in the sky and seeing the ball of light seemingly fall down over the horizon. To me, this is a picture of the journey with my health. As far as we know, I am not dying. I remain grateful for that. And since I have no formal diagnosis, I know that people are suffering from real debilitating diseases. Yet, the correlation remains. My body is deteriorating. (Actually, everyone is deteriorating. I have yet to meet the person who lives forever!) And my symptoms are real and scary. Many days I feel like I am trying to cling to these last moments with my family before the use of my body is stripped away from me. Yesterday I took my kids to a play area inside of a mall. My little ones played and laughed and had the time of their lives. We went upstairs to eat tacos and apples. When I went to stand up, my right leg was completely non-responsive. From my hip to my toes. While this seems to be happening with an increased frequency, and I am trying to accept a reality where I could soon become confined to a wheelchair if this continues to develop, I remain grateful. I am so grateful to still have time to watch my little ones have such joy and carefree lives, and their spirit reminds me of the way God created us. He did not want us to know this life of pain and suffering and evil. I am grateful that if I was to lose the use of my legs, that I still have my mental faculties, my ability to talk and my basic senses. I don’t say that to sound smug, but out of an appreciation that if my legs do decide to just permanently fail me, things I took for granted would be more inconvenient and would require some lifestyle changes, but would not affect my ability to still be able to enjoy so much of God’s creation. And so I am chasing the sun and clinging to summer. Trying to seize the days, appreciate when I feel good enough to get out and about and have everything working, and trying to make sure I laugh and remain grateful for these sweet moments with my family. I know many of you struggle. And feel hopeless. And maybe facing real loss of body parts, or like me, anticipate what is yet to come with the loss. I just want to offer you some encouragements. I do this a lot! I just try to minimize it in front of the kids, who really get scared when they see me break down and in so much pain. Expressing grief, sorrow, loss, fear, anxiety is so healthy to release and work through. 2. There are things you cannot control. An impossible statement to my type-A personality brain. But I am in a season of learning this. I love this promise in Romans 8:28 ” And we know that for those who love God all things work together for good”. 3. Remain focused on God’s plan for you. He does not allow suffering to happen arbitrarily. There is a plan and a purpose for your life, and for mine. And He will not take you out of this world until it’s accomplished. But we must make the days COUNT. We do not know when today will be our last. And until He brings me home, I cling to this verse: “For I know the plans I have for you,” declares the Lord, “plans for welfare, and not for evil, to give you a future and a hope” (Jeremiah 29:11). 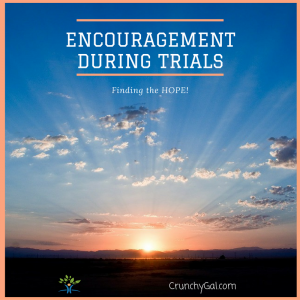 What is your favorite piece of advice during times of trial that gives you encouragement and hope?